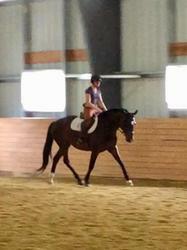 2014 Hanoverian Mare by Escudo ll. 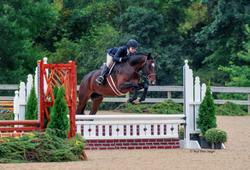 We can not say enough good things about this mare. She is a 10+ mover, she has flawless confirmation, a great temperament and excellent work ethics. This one has been very carefully stared and loves to work. She has three lovely gaits, learning her lead changes, is starting to do grid work and jumping small courses with great confidence. Should mature to 16. 1/2 to 16.1 with a solid body. 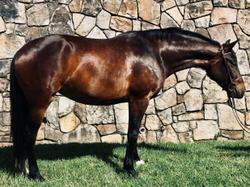 She has the looks, movement and scope to develop into a WEF quality hunter for a junior, adult or pro looking to develop a confirmation quality horse. She is currently showing in the Baby Greens (2’6”) and will be ready for the pre-greens, adults and children’s by spring. She has great success showing in hand as a yearling including ribbons at Devon. Life time USEF Membership. Full set of x-rays. Clips, loads and stand very quiet for vet and farrier. 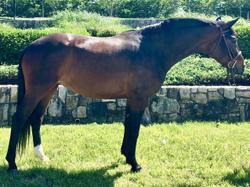 She has a very loving and affectionate personality and is by far the barn favorite. I love your website! Sold fast after the Ad was posted!